Are you ready to talk design? Next up in #ProjectCraftsDept is what I find to be the most challenging yet interesting and fun part of any home renovation project: figuring out the room layout. 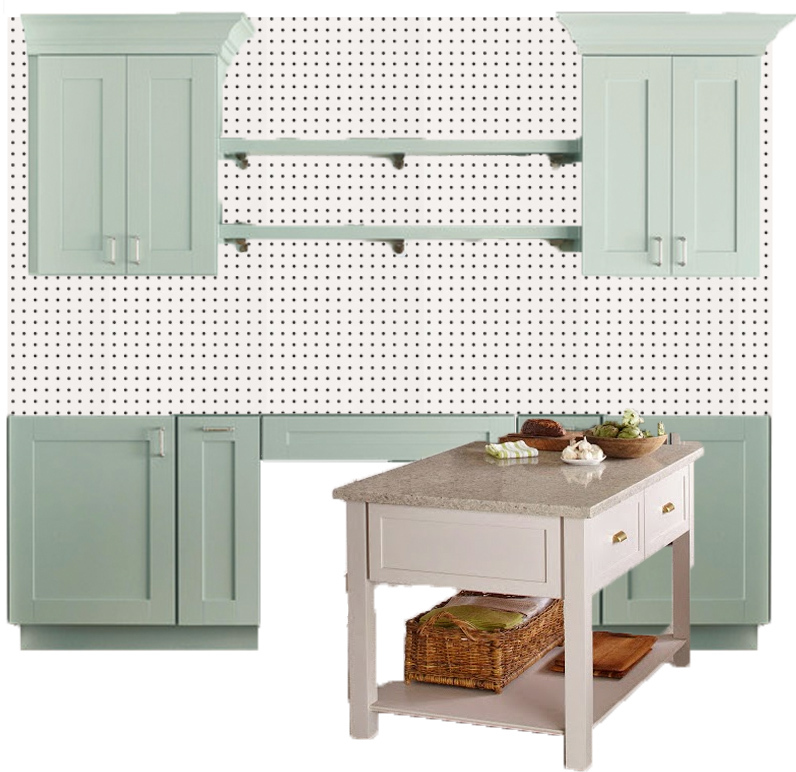 Keep on reading as I'm sharing my tips on how to save on the cost of cabinetry too! 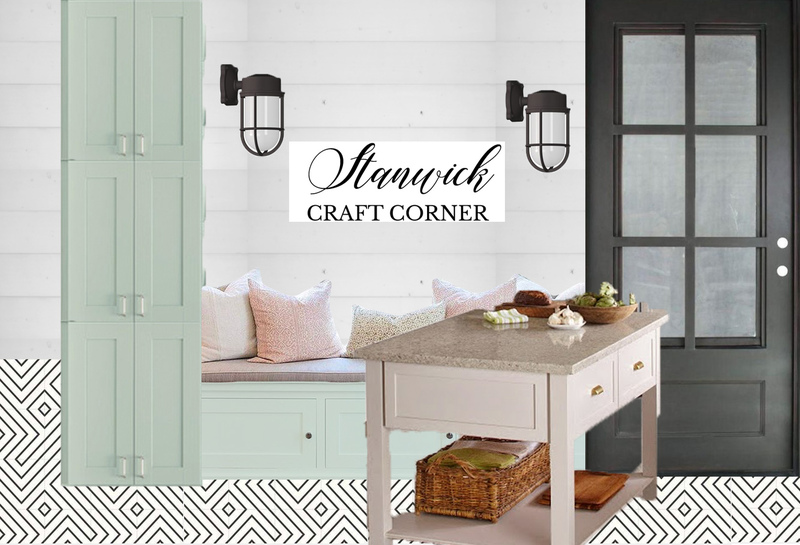 Originally, I thought I might like to incorporate a desk area into this wall, much like we had in the old craft room, but instead of dropping the counter height down, I'd keep it consistent and use a counter height chair to sit in. 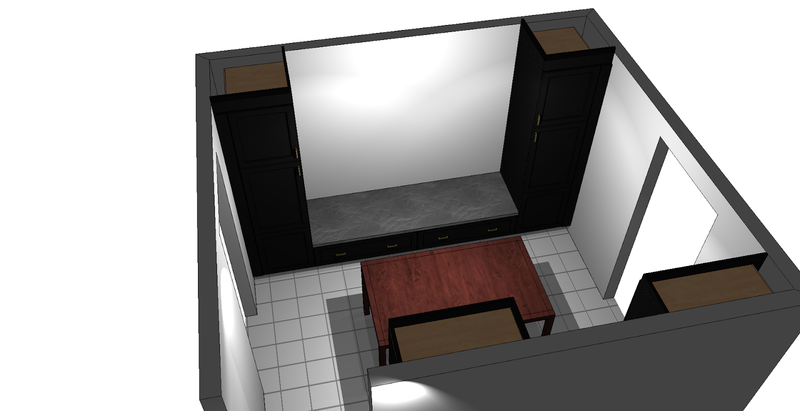 There would also be an island or desk in the middle of the room for working on bigger projects. A peg board backsplash would provide visible storage for small tools and items I wanted to keep handy. Mixing open shelving with closed cabinetry for the uppers would keep the design from feeling too heavy. The other side of the room would look like this, with a bench seat beside the door and a tall cabinet in the far corner. The tall cabinet might be a good place to store the vacuum and brooms, much like our old but pretty broom closet (how I miss that!). A patterned tile on the floor and black accents would ground the space. While I liked this design, it felt off. Would I really use that desk space when I had a perfectly good desk space upstairs? Likely not. There also didn't seem to be sufficient cabinetry. That lead to this design. Not enough cabinetry? Why not fill the whole wall with it! I took out the desk area and added wall to wall base cabinets. The open shelves were replaced with more cabinets but to keep the uppers from feeling too bulky, we could replace some of the cabinet doors with glass doors. The bench and tall tower would remain on the opposite wall. 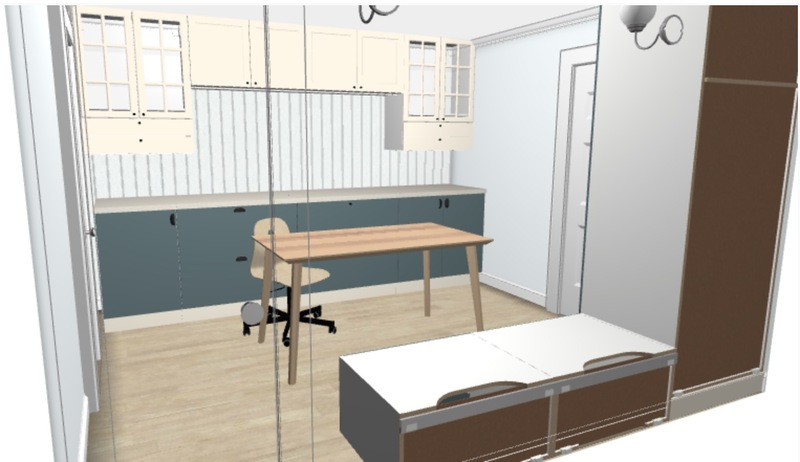 A table would float in the middle of the room, still allowing for foot traffic to travel into the cold storage room on the left and the laundry room on the right. I was feeling pretty good about this design. It was time to meet with The Home Depot Canada, our partner on this project, and get this idea on paper. It was great to meet with The Home Depot Canada kitchen specialist and translate my rough designs into a true workable plan. After hearing about the features of the different brands of cabinetry that The Home Depot Canada carries, we decided on the Thomasville Nouveau line. Thomasville is a brand I've long admired for their beautiful, high-quality products. I'll share more about the cabinet style, door design, and colour we selected (you might be surprised!) in my next post. 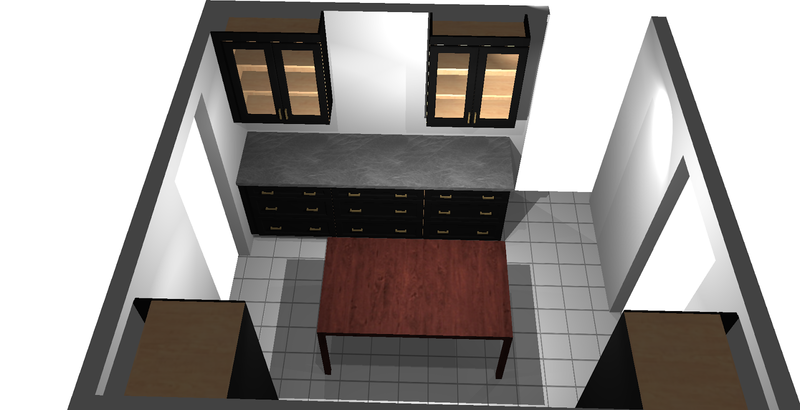 The kitchen specialist input my design into the virtual planner. There were so many things I hadn't considered (like would the bench be flush with the towers or set back, or would I need pull outs in the towers) so it was great to have her expertise. The problem with having all that cabinetry in the design is that things can get pretty pricey. Uh, yeah, I never considered that. I was just living out my craft room dreams, people! So very quickly we had to find a way to cut costs without sacrificing style and storage. Mission impossible? The almost 12' of base cabinets was killing our budget so we had to resolve that problem first. A very simple solution presented itself: flip the plan! Moving the bank of cabinets to the shorter wall did bring the cost down but we were still beyond our budget. We made some design changes and sacrificed a few elements, but finally, we came to a layout and cost we were happy with. Flipping the plan would also have the unexpected effect of making the craft room feel larger. You'd no longer look into the room and see a heavy wall of cabinetry. Instead, you'd see open wall space between the two towers and the towers would frame the bench seat nicely. We had just finalized the design when, luckily, we thought of an issue: would the tall towers fit down our basement stairs? No, the 84" tall cabinets would not fit down the basement stairs! 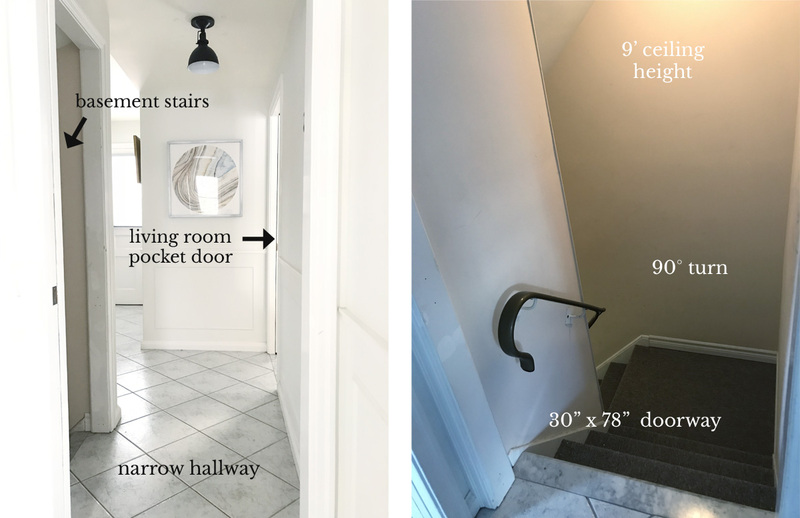 The narrow hallway at the top of the stairs meant that tall cabinets would have to enter the basement angled from the living room door, then had to be straightened up to make the sharp 90° turn. There would be no way the tall cabinets could clear the corner down the stairs. So, at the last minute, we switched the two 84" towers for 34" base cabinets with 50" cabinets stacked on top. Though this added cabinets and increased our budget, it would have been a much more costly mistake to have cabinets arrive on site that we couldn't use. You can bet I won't forget to check doorway heights and pathways the next time I order any cabinets!